Wing span: 1 1/8 - 1 1/4 inches (2.9 - 3.1 cm). 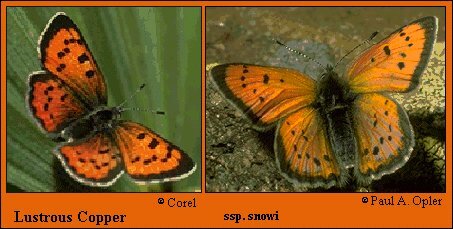 Identification: Upperside is shiny coppery red with small black spots and black border. Spots are larger in female. Underside is gray with many small black spots; forewing with overall copper tinge and black submarginal line; hindwing submarginal line is red. Life history: Males perch and patrol for females in hollows of open areas. Females lay eggs singly on or near host plant leaves; which the caterpillars then eat. Half-grown caterpillars hibernate. Caterpillar hosts: Plants of the buckwheat family (Polygonaceae) including alpine sorrel (Rumex pauciflorus), and other Rumex and Oxyria species. Habitat: Mountain meadows, sagebrush flats, glacial cirques, rocky treeless areas. Range: At high elevations in the Rocky Mountains from British Columbia south to New Mexico. Moderate to high elevations on Pacific Slope; Oregon to Sierra Nevada of California; western Nevada.